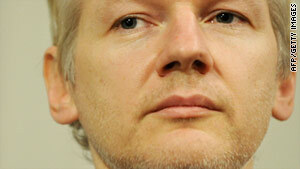 WikiLeaks, founded by Julian Assange, publishes documents alleging corporate and government misconduct. Lawmaker: WikiLeaks contributes to " freedom of speech and transparency"
(CNN) -- A Norwegian politician said he has nominated WikiLeaks for a Nobel Peace Prize, citing the website's contribution to "democracy and freedom of speech" worldwide. Nominations for the Peace Prize closed on Tuesday. Any lawmaker, academic or award recipient around the world can nominate anyone for the prize, according to the prize's website. Stortinget parliamentarian Snorre Valen said he nominated WikiLeaks because it has helped "redraw the map of information freedom." "Liu Xiabao was awarded the Nobel Peace Prize last year for his struggle for human rights, democracy and freedom of speech in China," Valen wrote on his blog. "Likewise, WikiLeaks have contributed to the struggle for those very values globally, by exposing (among many other things) corruption, war crimes and torture." WikiLeaks is a nonprofit website that publishes documents alleging corporate and government misconduct. Critics have accused it of endangering national security while defenders have said it protects whistle-blowers. The site has published numerous secret documents, including on the Iraq and Afghan war. Military officials have criticized the release of documents. U.S. Defense Secretary Robert Gates said he was "appalled" by the release of the Afghan War Diary last year.